With the game tied and two runners on base, sophomore Kayla Yamane promptly drove a ball to deep left field, lifting College of the Canyons to a 4-3 eighth-inning walk-off victory over Bakersfield College on Thursday. 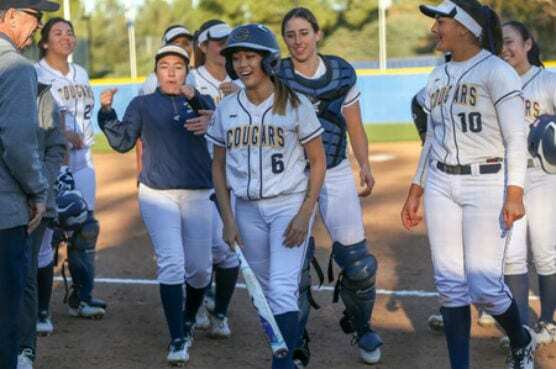 Yamane’s clutch hit, which came with two outs, landed just fair and allowed Sierra Boyajian to easily score from second base and bring the Lady Cougars onto the field in celebration. The Renegades (1-3) went ahead 3-2 when COC starter Megan Wilson issued a bases-loaded walk in the top of the sixth. That lead would once again be short-lived. In the seventh, it was Valerie Rivas’ RBI groundout that brought home Camryn Webb and sent the game to extras at 3-3. In the extra frame, Wissmath called upon reliever Kaitlyn Post, who got out of the inning clean after issuing a leadoff walk. Post eventually picked up the win after Yamane’s walk-off hit. Here’s the box score and a link to more photos. COC was scheduled for a road doubleheader at Cerritos College on Saturday, but those games were canceled due to inclement weather. Canyons will next see action in a road doubleheader vs. Cuesta College on Thursday, Feb. 14. Game times are scheduled for 12:30 p.m. and 2:30 p.m.